WITH SIX DO YOU GET EGG ROLL? Google's cage became a condo last night. 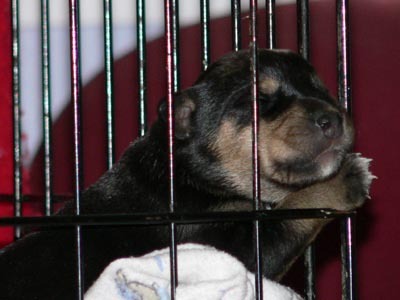 Ashley called to say there were 6 Rottweiler pups, one week old, who needed feeding. She had someone who could take three and asked if I would take the other three. What better Mothers Day gift than new babies? 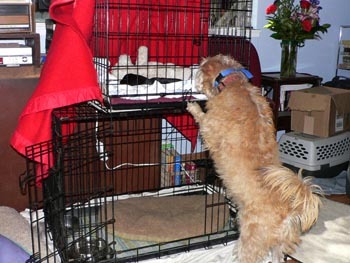 Walt set up the small cage on top of Google's bigger cage and we now have SIX dogs here. We are back in "little blob" world again, with barely moving little balls of black fur. Everything I wear smells of Esbilac again. I didn't name them right away, but it was clear that I needed to figure out who was who very quickly, since they are all female and all look pretty much identical. When I was feeding them at midnight I noticed that one had a white tip on her tail, so she became "Tipper." With one now identifiable, the other two were easy to tell apart--there was the big one and the little one. I do enjoy giving these little guys temporary names, however weird they may be. In the past I've named puppies in "sets," West Wing characters (Toby, Leo and Jed) and Harry Potter characters (Harry, Hagrid and Weasley), for example. No "set" came instantly to mind, and as I was drifting off to sleep, I was thinking about where to pull names from, thinking about the shows we've seen lately. One of the minor characters in Hair was played by a young actress who was cute as a button, so I decided to name one of the puppies "Crystal," the name of that character. Crystal is the pup with the least brown on her face. That left "the other one," and I went with the show we saw on Friday, "fig (a): the heart," where the central character was named Ruby. 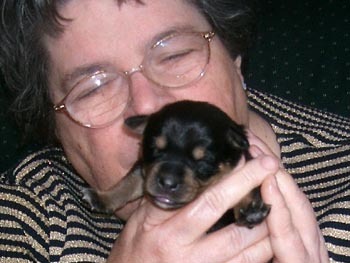 Ruby seemed like a good name for a Rottweiler. So now we have Ruby, Crystal, and Tipper and a new adventure begins. What's nice is that I can tell them apart already, though they all look so much alike. Sheila, as usual, rolled her eyes, sighed and walked away. She's more interested in them when they are big enough to hold their own in play with her and when she doesn't have to be reminded to be gentle. Lizzie was, of course, ecstatic to have new playmates. She's now been though two puppy experiences and seems to instinctively know that she can't immediately jump in and play, though it kills her to hold back. Google, though, had never seen anything like this before, and she is VERY intrigued. Google is also upset that they are hogging lap time with me. Ashley had offered to move Google to another foster home, but she really is no bother around here and now that she and Lizzie get along so well, I couldn't see any point in making her have to make another adjustment, when she's had such a traumatic time of it recently. So Google stays for the nonce, we're settling into a routine with the new puppies, and Walt is about to take off for another couple of weeks in Santa Barbara. The puppies had a great first night. I fed them at midnight...they have a bit of a learning curve to get the hang of sucking on my finger, but that will come. I was going to sleep in my recliner so I'd be sure to hear them, but Sheila really, really wants me to sleep in the living room, so we all went to the couch. 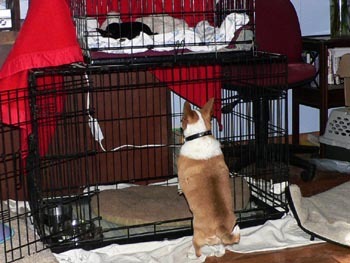 I heard the puppies wake up around 4:30 and I got up to make formula, but by the time I had the formula all made, they had quieted down again, so I decided to let them sleep until they were really making noise. I got into the recliner and was able to sleep for 2 more hours. In those two hours I had one of the weirdest dreams I've ever had...and it's blatantly obvious why. In the dream, I was in our bathroom, just having gotten up from the toilet. I was appalled to discover that there was no toilet seat on the toilet itself. It was just a sharp-rimmed white bowl. The toilet had overflowed and there were big brown blobs all over the floor. I was starting to pick them up when I realized that some of the brown blobs were puppies. That's when I woke up. Sometimes you have strange dreams and wonder what in the world caused you to dream that. I think it's fair to say there is NO question whatsoever about why I had this particular dream!! !